A toothy, long-nosed skull found in Texas belonged to a “swamp monster” that lived more than 200 million years ago. 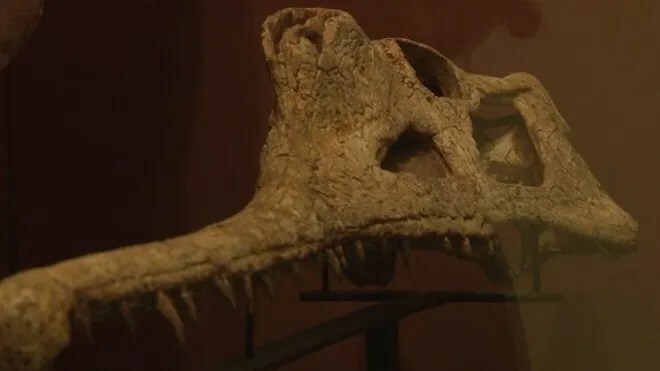 The creature is a previously unknown type of phytosaur, an extinct creature that hunted fish and other prey along the shallow edges of rivers and lakes. Dubbed Machaeroprosopus lottorum, the phytosaur probably measured about 18 feet long. Discovering something new Phytosaurs are a common find in the Cooper Canyon formation in Garza County, Texas, where the new species was discovered. This area is now dry and scrubby, but in the late Triassic, it was a conifer forest with fern underbrush and an oxbow lake where phytosaurs hunted. In 2001, Doug Cunningham, a research field assistant at the Texas Tech museum, unearthed the new skull during a dig. That preparation took years. Once the skull was out of the rock surrounding it, Mueller and his colleagues compared the features of the skull with other phytosaur skulls (more than 200 have been found in North America). They also analyzed another phytosaur skull, found 120 feet from the first. They discovered that their specimens represented a male and female from a new species, which they named M. lottorum in honor of the Lott family, the owners of the ranch where the fossil was found. Extinct monster Phytosaurs lived from about 230 million to 203 million years ago. They were one of the victims of the Triassic-Jurassic mass extinction, a huge die-off that wiped out many large land animals. The new female’s skull is about 3 feet long, and she would have grown to be about 17 feet total length, Mueller said. The male would have been about a foot longer. M. lottorum‘s delicate snout suggests it ate mostly fish, and not more robust prey. It would have looked very much like an alligator or crocodile, but its nostrils were up near its eyes at the base of its snout, rather than at the end. The researchers reported their findings in the September 2013 issue of the journal Earth and Environmental Science Transactions of the Royal Society of Edinburgh.